We have reached Lima which is the end of the first leg of the cruise, and our two friends from Palm Springs have left us. The second half of the cruise will take us up the west coast of South America, through the Panama Canal, into the Caribbean, stopping at several islands on the way, and then on to Charleston and New York. We are now being joined by the two Australian ladies who we met on the cruise up the west coast of Africa last year. For those of you paying attention to the blog of that journey, you may remember them as the ladies who carried a supply of gin in shampoo bottles in order to get them on to the plane as carry on luggage. It also had the advantage of fooling hotel staff into thinking that they washed their hair a lot rather than sitting in their room drinking gin. The ship stops in Lima for two nights and as the change over in traveling companions is due to take place in one day, when in the morning we would say goodbye to two gay men and in the afternoon we would say hello to two elderly widows, we decide to abandon ship for two days to give us time to acclimatise to the change. So we leave the ship and fly to Arequipa for two nights. 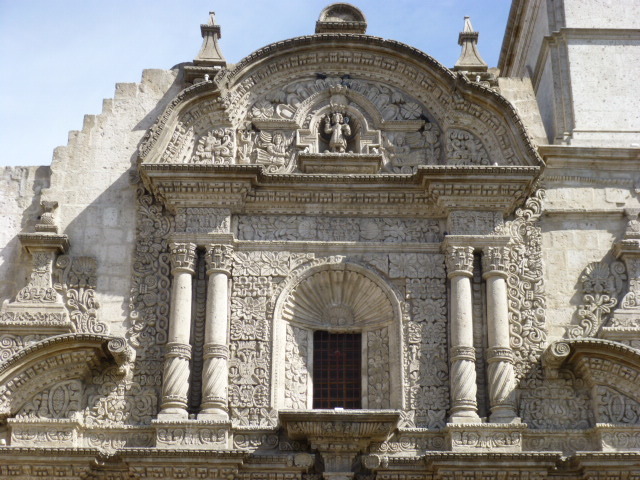 Arequipa is in southern Peru high up in the foothills of the Andes, and is surrounded by snow covered peaks. It is a stunningly beautiful Colonial city dating back to the 16th century, built with a white volcanic stone called sillar which glistens in the sunlight. We love it. 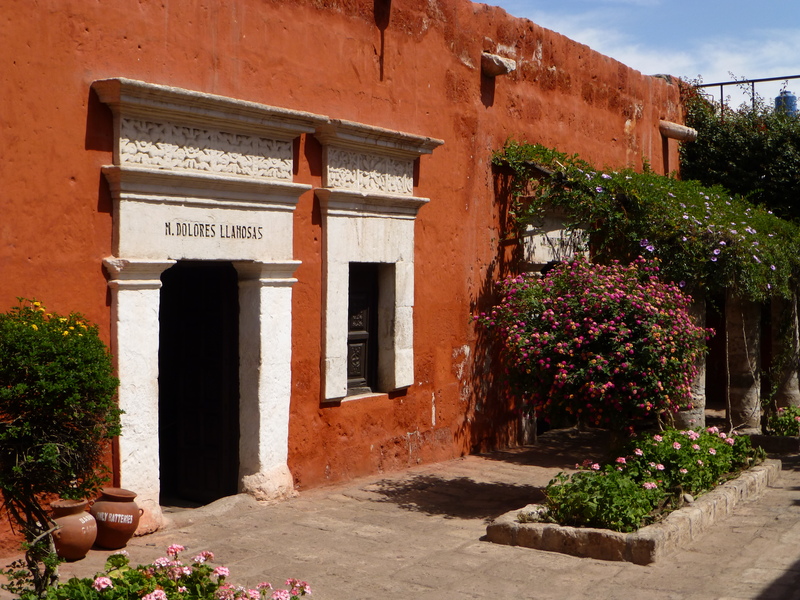 Arequipa first came to the attention of the rest of the world when a little known convent in the middle of town was struck by two huge earthquakes in the late 1980’s. Unable to pay for the restoration, the nuns were forced to open their doors to a fee paying public for the first time in 400 years, keeping a small private area of the monastery for themselves. And so, what has been called one of the most beautiful religious buildings in South America, is now revealed. Word spread of this beautiful monastery and the equally beautiful old town that it sits in and by 2000 the entire old town had been made a World Heritage site. 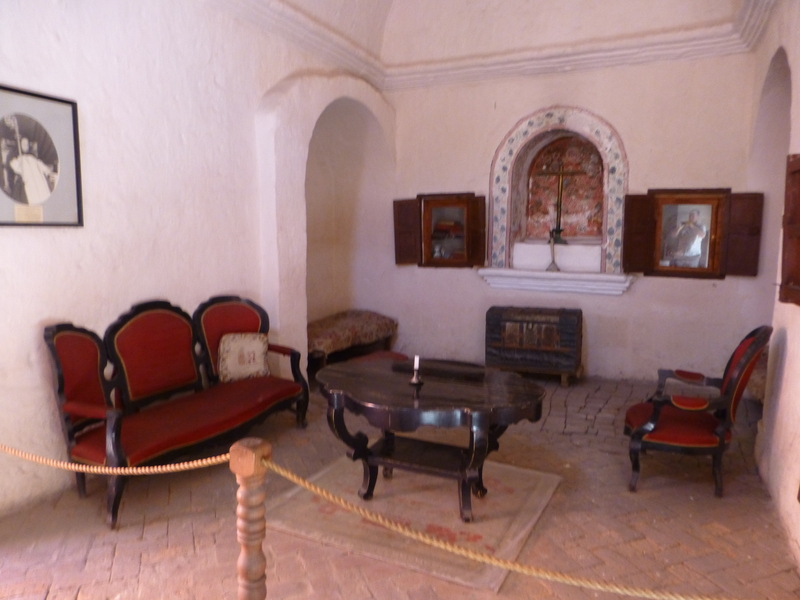 The Monasterio de Santa Catalina is just phenomenal. It is like a small village unto itself and now the public can wander all the streets and visit a huge number of the cells. 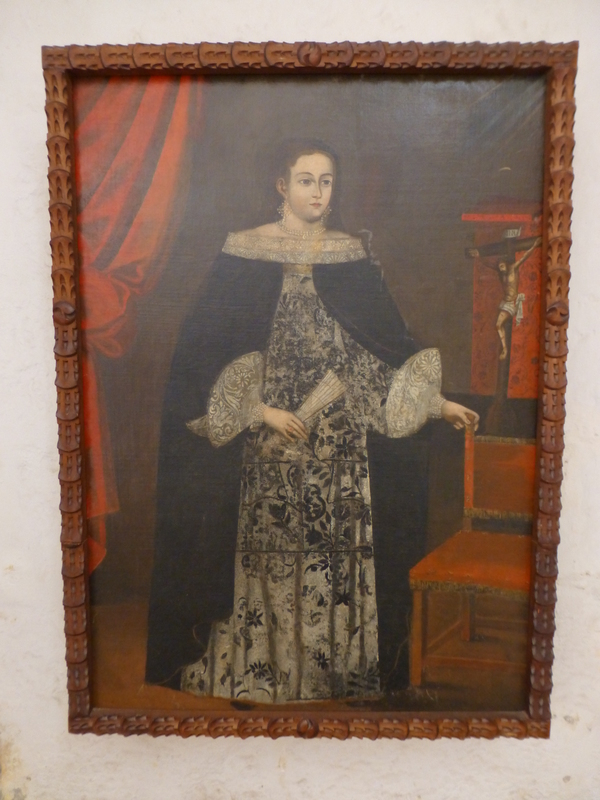 It was founded in 1579 by Doña María de Guzman, a wealthy widow and filled with more wealthy women who supposedly gave up the world and their riches for a quiet life, but in reality kept just a little of their fortune to turn what should have been a monastic cell into a less than monastic suite consisting of a sitting room appropriately furnished with a harpsichord, overstuffed sofa, dining table and chairs and an alcove with what appears to be a double bed in it. Off this large and comfortable room there is an impressive kitchen and often a patio. To add to the dichotomy, these monastic suites could be bought and sold, perhaps starting one of the earliest real estate booms. Obviously the less wealthy nuns were the ones who lived in the little one room cells! 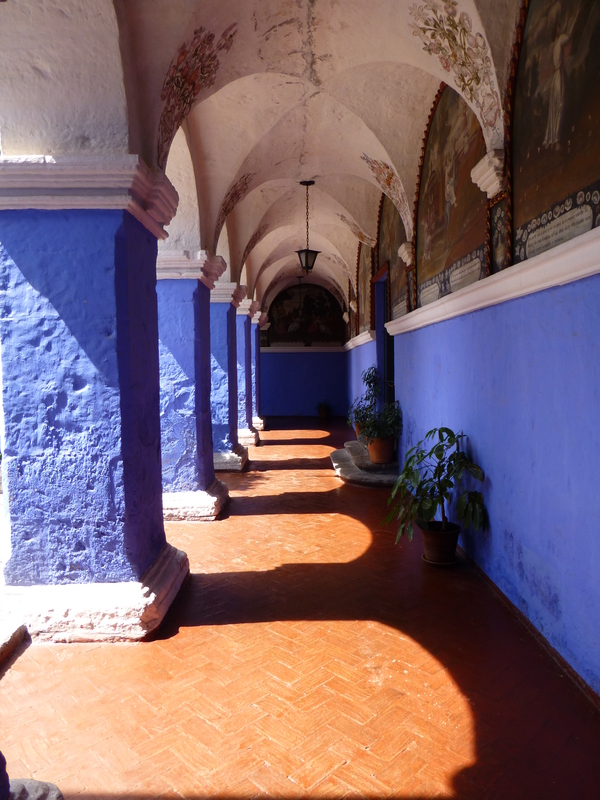 The entire monastic village is built in the white sillar stone with areas washed with naturally produced colours of deep indigo blue, strong terra cotta red, and a vivid yellow. It is breathtaking and we spend over three hours taking it all in. There is even a penned in area full of guinea pigs. We are rather surprised that the nuns are allowed pets. Needing a little relaxation before continuing our tour of the city we come across a therapeutic massage establishment where a blind masseur offers a one hour massage for $20. There is a long waiting list which adds to the appeal. We put our names down for a massage later in the afternoon. It seems like a bargain until I discover that the first thirty minutes is taken up by the masseur trying to find me. Adding to the delights of the city are several highly rated restaurants. We choose one that gets particularly good reviews on trip advisor and settle in for the evening. The waiter informs us that the special tonight is a “crispy guinea pig”. I think back to the Monastery and see the nuns in a whole new light. They are enjoying their pet guinea pigs in quite a different way from how I had imagined. At first I am repulsed by the idea of eating guinea pig, but then I think I should be brave and try it. I know I am in trouble when the waiter asks if I would like it served with the head on or off. I may be brave, but I am not stupid. The poor thing arrived headless on a plate, spread eagled and cooked to a crisp..
At this point, dear reader, I am happy to pass on what I hope will be an edifying tip. Should you ever wish to try one yourself you might like to know that there is very little meat on a guinea pig. What little there is, is found on the thighs and tastes like a cross between chicken and pork. What I am really eating is a lot of guinea pig skin, which I have to tear away from its little bones, leaving behind a sad little carcass with most of the innards still attached. If that is not enough to spoil my appetite, trying to digest the skin is. It is chewy and a little crunchy and tastes of little but fat and is hard to swallow. While I am trying to look as if none of this is a surprise to me because I eat guinea pig regularly, I am hoping against hope that I won’t come across a hairy bit, and desperately trying not to think of Charlie, the pet guinea pig I had as a child. It is true that he was an amazingly dumb animal who spent most of his day running furiously inside a wheel getting absolutely nowhere but not seeming to care, but it is also true that he liked to be picked up and cuddled and was delightfully soft and cute. He was also edible, but I didn’t know that back then and would have refused to believe that one day I would end up eating his great great great grandchild. 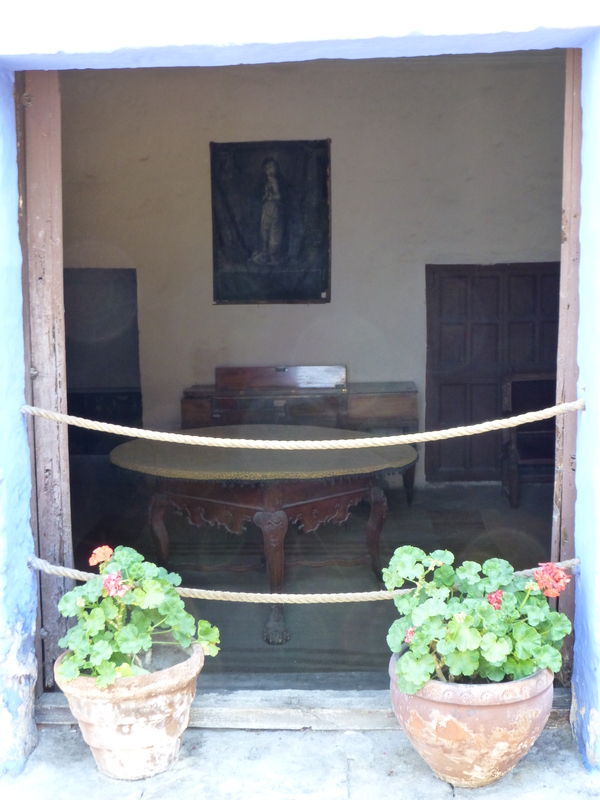 This entry was posted in Arequipa, Guinea Pigs, Peru. Bookmark the permalink. ‘…the first thirty minutes is taken up by the masseur trying to find me.’ Drum roll, clash of cymbals, I thank yew. Here all week. Sounds like Charlie had a lucky escape. 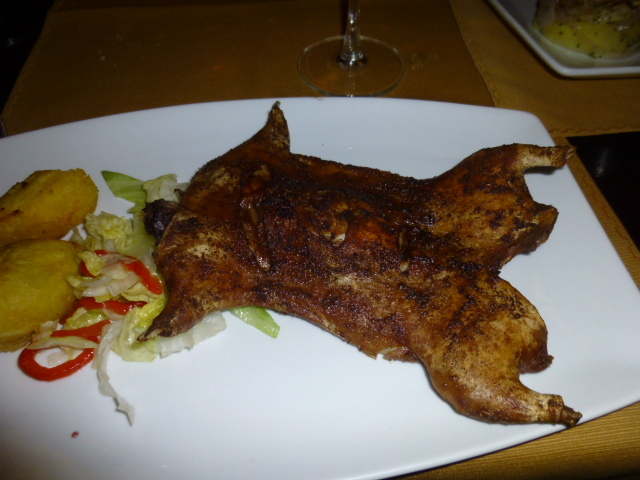 Brought back images of push carts in Quito selling roasted guinea pig — thanks for that !